Combining the history of Louisiana cuisine and New Orleans-style cocktails, this event is a feast for the senses! Along with your guide you will visit up 8 locations: award-winning seafood restaurants, James Beard Award-nominated craft cocktail lounges, funky gastropubs, artisanal candy stores and more. Once inside you’ll sample up to 10 different dishes that represent the modern expressions of our culinary heritage: classic dishes like gumbo and alligator boudin, but also new interpretations like crawfish beignets and curried pork skins! We'll also enjoy 4 full-sized cocktails like the mighty Sazerac, the rum-heavy Hurricane, the classic Daiquiri and more! This 4-hour gastronomic odyssey is our way of showing you where we like to go now, and what we like to eat and drink once we're there. With so many dining and drinking options in New Orleans, why not try up to 8 different places in one fell swoop?! The walking tour begins at the award-winning Red Fish Grill in the French Quarter neighborhood of New Orleans. You will begin with two dishes: Alligator Boudin with 3 Mustard Sauce, followed by an Alligator Sausage & Seafood Gumbo. This part of the tour focuses historically on the colonial period of Louisiana history, and usually lasts about 35 minutes. Moving four blocks down you will enter Pepper Palace, where we begin to discuss the Cajun influence, and sample an unlimited variety of hot sauces, BBQ sauces, Buffalo Wings sauces, salsas, dry rubs and more. Customers on the tour will also receive a free bottle of Louisiana-style hot sauce. The next stop is two blocks away and known as Saint Lawrence, an off-the-beaten-path gastropub with a huge beer selection, craft daiquiris & upscale bar bites. You will experience a true New Orleans rite-of-passage: a frozen Pimm’s Cup “to-go”. From there you move 4 blocks up to Leah’s Pralines: a 3rd generation family-owned candy store. You will sample traditional pralines and their unique Bacon Pecan Brittle. One block around the corner is the next venue, the Longway Tavern. As you learn about Louisiana’s 19th century influences you will sample a "Chef's choice" spread of modern interpretations in this hip, new gastropub. Three more blocks over and you will arrive at the award-winning Dickie Brennan’s Tableau to sip your next cocktail: the refreshing French 75, a combo of fresh lemon, brandy or gin, and bubbles. 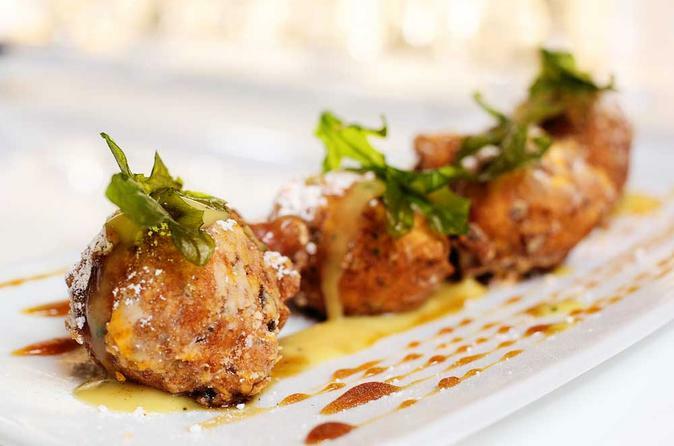 From there you pass through famous Jackson Square towards Café du Monde, then along the French Market area, ultimately landing at the James Beard Award-nominated Cane & Table. With a focus on rustic colonial cuisine and playful rum drinks, you will sample their unique curry pork skins and a classic daiquiri of Caribbean white rum, fresh lime and sugar. You will then move on to Trinity Restaurant, a sleek new venue focused on elevated Creole dishes with seating on the upstairs balcony. You will wrap the tour with Crawfish Fontina Beignets, and your choice of a Sazerac or craft Hurricane.